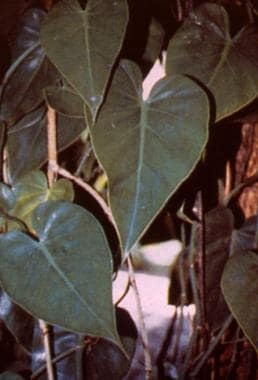 The plant species most frequently reported in human exposures were Spathiphyllum, Euphorbia pulcherrima, and Ilex.Philodendron and Caladium species were also listed among the most commonly reported plant exposures. 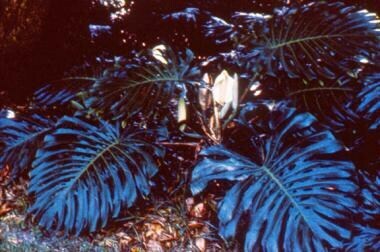 Philodendron and Dieffenbachia species are commonly found in homes, offices, and waiting rooms. See the images below. 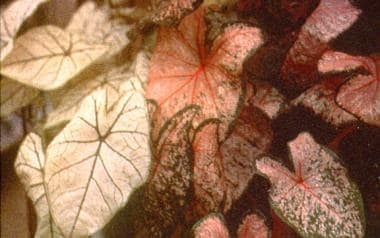 Philodendron, Dieffenbachia, and Caladium contain calcium oxalate crystals packaged into bundles called raphides. However, the presence of calcium oxalate crystals alone is not enough to cause the toxicity seen with exposure to these plants. Although the exact mechanism of toxicity remains unclear, the presence of proteolytic enzymes, in addition to specialized cells that forcibly expel the raphides, seems to be necessary to inflict injury. See the images below. Patients with history of oral exposure (chewing and/or swallowing) have been reported to have severe swelling, drooling, dysphagia, and respiratory compromise, but this is not common. In a large retrospective study of 188 patients with plant oxalate exposure, all cases were determined to be minor and all resolved with minor or no treatment. Patients can also experience dermal and ocular exposure, resulting in contact dermatitis or keratoconjunctivitis. Symptoms that result from these routes of exposure also appear to resolve with supportive care. The serious complication of aortoesophageal fistula following ingestion of a dieffenbachia leaf in a girl aged 12.5 years has been described in a single 2005 case report. The girl recovered following surgical intervention. Plenert B, Prasa D, Hentschel H, Deters M. Plant exposures reported to the Poisons Information Centre Erfurt from 2001-2010. Planta Med. 2012 Mar. 78(5):401-8. [Medline]. Snajdauf J, Mixa V, Rygl M, Vyhnanek M, Moravek J, Kabelka Z. Aortoesophageal fistula--an unusual complication of esophagitis caused by Dieffenbachia ingestion. J Pediatr Surg. 2005 Jun. 40(6):e29-31. [Medline]. Altin G, Sanli A, Erdogan BA, Paksoy M, Aydin S, Altintoprak N. Severe destruction of the upper respiratory structures after brief exposure to a dieffenbachia plant. J Craniofac Surg. 2013 May. 24(3):e245-7. [Medline]. Arditti J, Rodriguez E. Dieffenbachia: uses, abuses and toxic constituents: a review. J Ethnopharmacol. 1982 May. 5(3):293-302. [Medline]. Cumpston KL, Vogel SN, Leikin JB, Erickson TB. Acute airway compromise after brief exposure to a Dieffenbachia plant. J Emerg Med. 2003 Nov. 25(4):391-7. [Medline]. Evans CR. Oral ulceration after contact with the houseplant Dieffenbachia. Br Dent J. 1987 Jun 20. 162(12):467-8. [Medline]. Gardner DG. Injury to the oral mucous membranes caused by the common houseplant, dieffenbachia. A review. Oral Surg Oral Med Oral Pathol. 1994 Nov. 78(5):631-3. [Medline]. Krenzelok EP, Jacobsen TD. Plant exposures ... a national profile of the most common plant genera. Vet Hum Toxicol. 1997 Aug. 39(4):248-9. [Medline]. Kuballa B, Lugnier AA, Anton R. Study of Dieffenbachia-induced edma in mouse and rat hindpaw: respective role of oxalate needles an trypsin-like protease. Toxicol Appl Pharmacol. 1981 May. 58(3):444-51. [Medline]. Lawrence RA. Poisonous plants: when they are a threat to children. Pediatr Rev. 1997 May. 18(5):162-8. [Medline]. Mrvos R, Dean BS, Krenzelok EP. 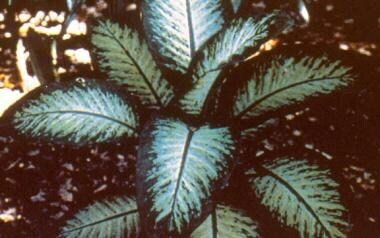 Philodendron/dieffenbachia ingestions: are they a problem?. J Toxicol Clin Toxicol. 1991. 29(4):485-91. [Medline]. Pedaci L, Krenzelok EP, Jacobsen TD, Aronis J. Dieffenbachia species exposures: an evidence-based assessment of symptom presentation. Vet Hum Toxicol. 1999 Oct. 41(5):335-8. [Medline]. Rao SK, Kumar SK, Biswas J, Fogla R, Gopal L, Padmanabhan P. Self-induced corneal crystals: a case report. Cornea. 2000 May. 19(3):410-1. [Medline]. Rauber A. Observations on the idioblasts of Dieffenbachia. J Toxicol Clin Toxicol. 1985. 23(2-3):79-90. [Medline]. Sanchez-Morillas L. Contact dermatitis due to Dieffenbachia. Contact Dermatitis. 2005 Sep. 53(3):172-3. [Medline]. Seet B, Chan WK, Ang CL. Crystalline keratopathy from Dieffenbachia plant sap. Br J Ophthalmol. 1995 Jan. 79(1):98-9. [Medline].